﻿ Caption This! : Who Wears Short Shorts? A holier than thou right-wing Christian site. 1. "No, ma'am, I'd say you were too late to be the Thursday babe... about 70 years too late." 2. "Um... I choose bombs." 3. Warning: Do not spend more than four hours on the Kegel Exerciser. This woman is 24 years old. 4. "Grandma's Wedgie" was a huge country hit for Garth Brooks in 1994. 5. "Well, now you've done it. All the grandchildren are now gay. Happy now?" "Please lady, no I don't want any free hugs..."
Mean Ol' Mr. Gravity's gone and done it again. Failed ad campaign #43 Buy Depends. Because some clothes shrink when they get wet. Ma'am, there's been a unanimous request that you stay away from the food vendors. That Wal-Mart vest is a chick magnet. Appropriately enough, Marge operated the carnival's cottage cheese stand. "Frankly I think GoldenPalace dot Com could've better spent their money." After working for months, as the Barbara Bush look alike call girl for the Iraq Study Group, Sally took a much needed vacation. 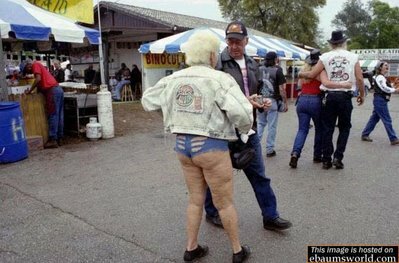 Mrs. Claus takes a vacation and learns about Bermuda thongs. Jell-O's efforts to corner the senior citizen market with its "Watch it wiggle, see it jiggle" campaign fell disasterously short of the mark. Yes, Emma. Saline injections have made you a perfect match for "Inflated Scrotum Guy." The man selling binoculars went out of business. Another man selling blindfolds, however, made a mint. Buy Depends. Because some clothes shrink when they get wet. "You were right, Martha. That Brazilian was the way to go." Do NOT mess with carny moths. "No, I haven't seen any 'Free Hugs" signs around here." Ack! We have much better taste here in Bermuda! Madonna caught before her spa retreat. Whoa, Al; you've REALLY let yourself go! "T'was I", said Mo the K.
Uh, who sent you the pic, that is! Barnum and Bailey's came up with a new, non-intrusive medicinal aid when the FDA banned Ipecac syrup in the public aid tent. Were There Thursdays in the 70's? Hey, Look, Two Dogs Doin' It! Either the Worst or Best Tuesday Evar. Um... Penn State... Why Not?